Deviled eggs are a classic dish – in fact, people have been eating different versions of deviled eggs at least since the time of the Roman empire. 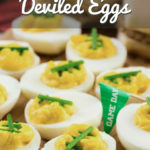 Deviled eggs are popular at any party, especially a game day party with a buffet full of tasty bite-sized appetizers. 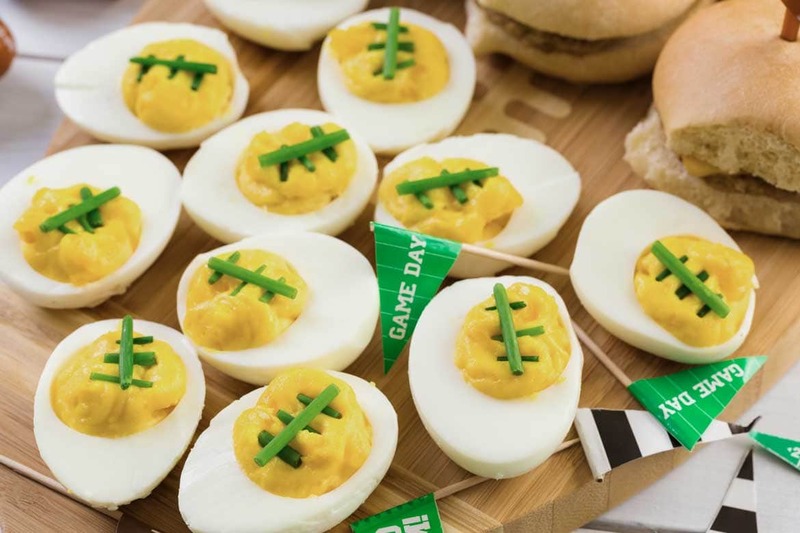 These adorable football deviled eggs are healthy, filling and full of flavor, and they deserve a spot on your game day buffet. For these football deviled eggs, I used a classic deviled egg recipe with a garnish of chives to make the egg halves look like tiny footballs. Deviled eggs are easy to make, but a little time consuming. Boiling the eggs and removing the shell is the trickiest part of the process. Sometimes the shells won’t come off easily. For this recipe, it’s best not to use farm fresh eggs. Older eggs have dehydrated a bit, so the inside of the egg has pulled away from the shell, making the egg easier to peel. Believe it or not, the eggs sold at grocery stores are usually a couple of weeks old, so they’re perfect for hard boiled eggs. 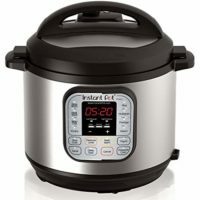 I think the Instant Pot programmable pressure cooker is by far the easiest way to cook boiled eggs. When you boil eggs in a pressure cooker, the shells don’t stick. If you want to know how to make pressure cooker boiled eggs, check out this post from Mike Vrobel of Dad Cooks Dinner. If you’re going to boil eggs on the stovetop, The Kitchn recommends putting the eggs in a pot, covering with cold water, bringing the water to a boil, then removing the pot from the heat and letting the water cool as the eggs finish cooking. That’s also the way my 8th grade home economics teacher, Mrs. Winder, taught me to do it. If you crack the cooked eggs slightly and soak them in ice water for a few minutes, that will help loosen the shells. I’ve noticed recently that Costco sells cooked deviled eggs with the shells removed. If you used those eggs for this recipe, it could be a huge time-saver. Once the eggs are boiled and peeled, cut them in half lengthwise and pop out the yolks. You can tell from the photo that these eggs are a little overcooked, because I left them in the IP a minute too long. No worries – they’re still going to taste fine. There are lots of ways to flavor the yolk mixture for deviled eggs, but I like to use mayonnaise, mustard, dill pickle juice and black pepper. If you don’t have dill pickle juice, substitute white wine vinegar and a little salt. 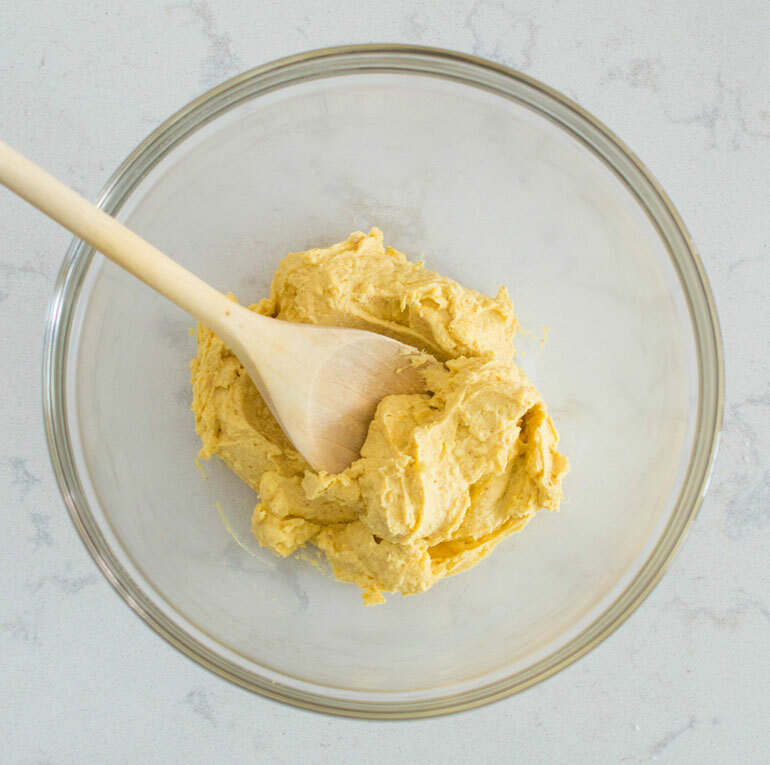 You can use any kind of prepared mustard, but for this recipe I like tangy yellow mustard. For a small batch of deviled eggs, I mash the yolk mixture with a fork, then continue mashing with a wooden spoon until all the lumps are gone. It takes a little patience to get a smooth mixture. For a big party-sized batch of football deviled eggs, it’s easier to prepare the yolk mixture in a food processor. Put the yolk mixture in a pastry bag, and use that to fill the center of each egg half. 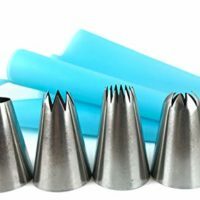 For this recipe, I used a pastry bag with a jumbo round tip. 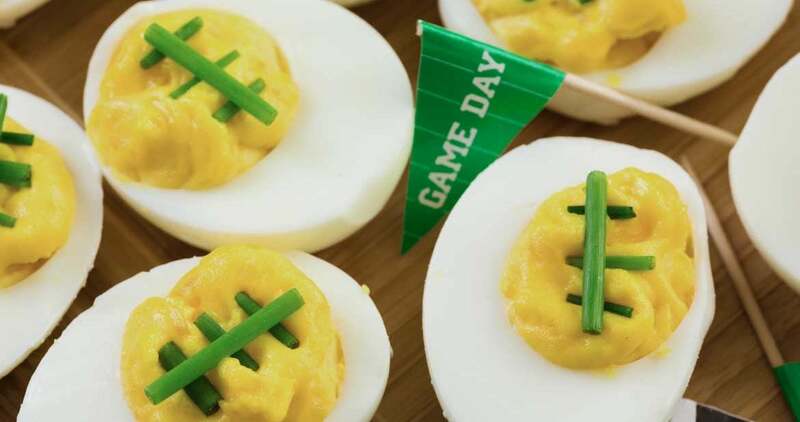 Garnish your football deviled eggs with chives cut into longer and shorter strips, then arranged to look like the stitching on a football. (Just to be clear, we’re talking about an American football like the one they use in the Super Bowl.) Press the chive strips into the deviled egg filling with your fingers. This process gets a little messy, so have a clean towel handy to wipe off your fingers. It’s easier to use chives for this recipe and not green onions. I’ve used the tops of green onions for this recipe, but they are thicker, so I had to cut them into narrow strips with scissors. More work = no bueno. 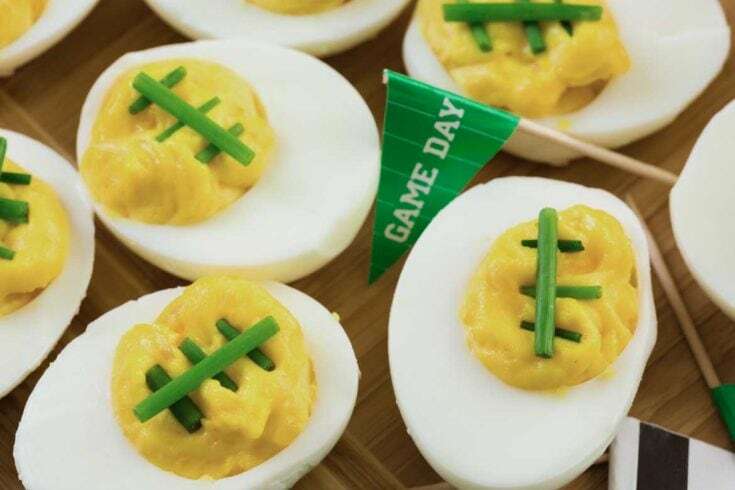 Don’t these football deviled eggs look cute? 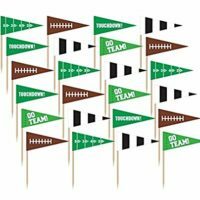 If you want to go all out, you can serve them with fun little pennant toothpicks. Football foods are better than the game itself, if you ask me. Tasty football foods never disappoint, even if the game is a stinker. Your party guests will love these football deviled eggs. They’re full of protein and moderate in fat, so they’re healthier than some of the super-cheesy dips you’ll find at game day parties. 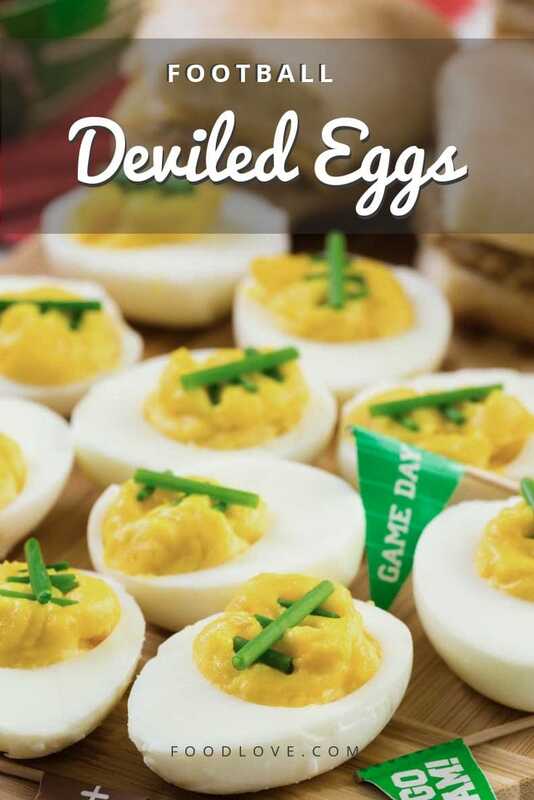 Tasty deviled eggs are a game day classic! 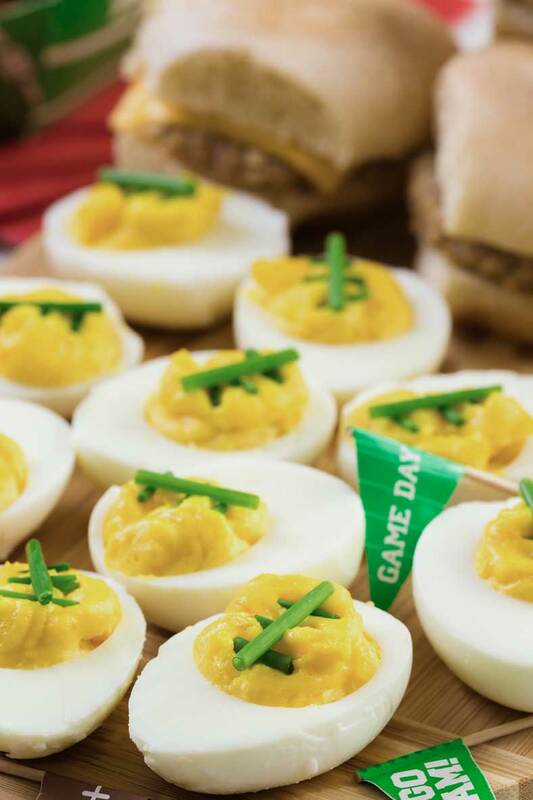 These adorable football deviled eggs are healthy, filling and full of flavor, and they deserve a spot on your game day buffet. Hard boil the eggs and remove the shells. 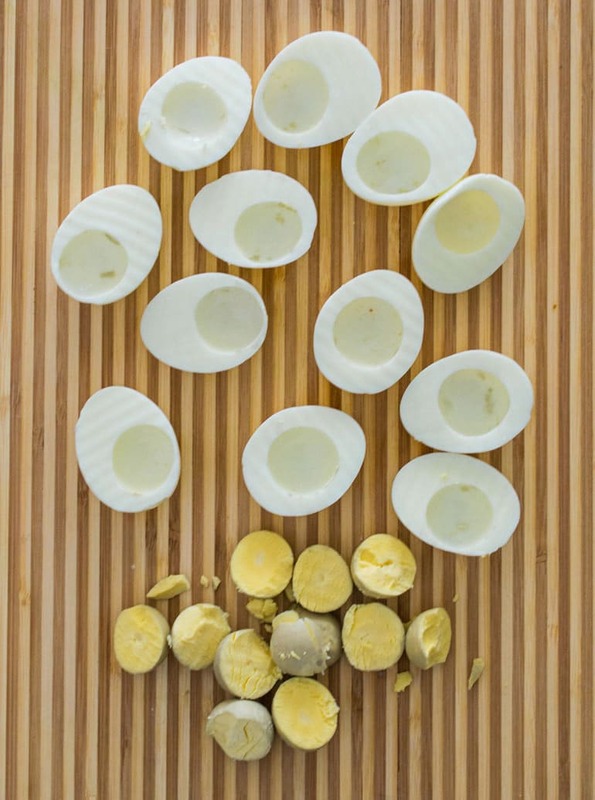 Cut the boiled eggs in half lengthwise, and pop out the yolks. Put the egg yolks in a bowl with the mayonnaise, mustard, dill pickle juice and black pepper. Mash with a fork, then continue mashing with a wooden spoon until there are no lumps. You can also use a food processor for this step. Put the yolk mixture in a pastry bag fitted with a jumbo round tip. 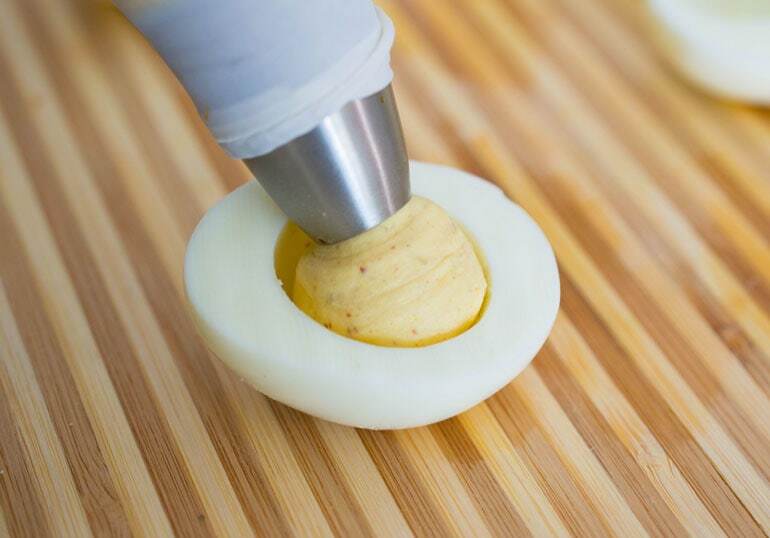 Use the pastry bag to fill the hole in each half egg with the yolk mixture. If not using a pastry bag, fill the egg halves using a teaspoon. Wash and dry the fresh chives. Cut the fresh chives into longer and shorter strips with scissors, and arrange these on top of the deviled eggs to look like the stitching on a football. Press the chive pieces lightly into the deviled egg filling with your fingers. Photos by Marsha Maxwell and Arina P. Habich/Shutterstock.com. Yes, they really are yummy, and fun! Good for your low carb friends.